Kétnyelvű könyv, magyar és angol nyelven. Wagner’s oeuvre was for decades unknown in Hungary. A few monumental works – Corpus Hungaricum in Székesfehérvár, and Garden of Philosophy erected on Gellért Hill in Budapest, as well as the statue of József Attila in Nagyvárad – only entered the art scene after the death of the sculptor. This book attempts to draw up his sketchy portrait. 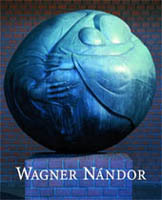 His art establishes links between Central and Western Europe and the Far East, synthesising different cultures, traditions and mentalities which, under the 20th century’s erratic creative conditions and circumstances, inspired and determined by influences, articulate an exciting, enticingly passionate and deeply felt, perplexingly profound and rich, genuine portrait of an age.